The concept of a cycling “black box” has always been intriguing to us. The ability to have detailed information regarding what happened before, during, and after an accident can be critical—not only determine cause and responsibility but to also aid in the treatment and care of the persons involved. To that end, we have spent the past two months reviewing the GoPro Hero3 (http://aerogeeks.com/2013/08/16/gopro-hero3-first-ride/) to see how it performed in this role. And while it does almost everything we want, it is somewhat overkill for a blackbox-specific role. To record rides in the interest of safety you don’t need 1080p HD video, WiFi or the ability to dive 100+ feet deep. 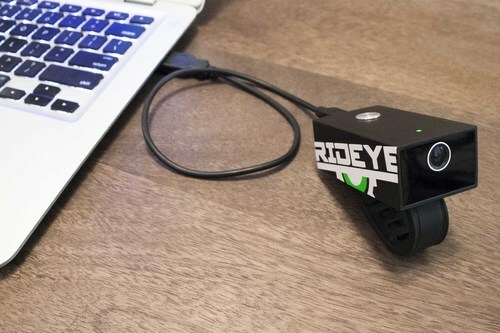 What you need is a rugged camera that can record in high enough quality to capture license plates and enough battery life to survive even the longest rides, which is exactly what the Rideye was developed for. With 24 hours of battery life and 2.5 hours of onboard video storage (10 hours for the high capacity version), the Rideye is built to be very good at one specific task—recording your rides. The Rideye automatically overwrites old video with new video on a continuous loop. However, if the onboard accelerometers detect an accident they automatically place the most recent files in a non-over-writable location to ensure the data is there if you need to look at it later. 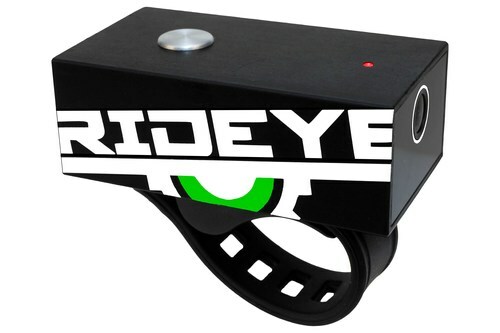 The Rideye is constructed from CNC aircraft-grade aluminum with laser cut Lexan inlays. It measures in at 1” x 1.5” x 3” and has a current claimed weight of 185g. Our only small gripe with the concept (and one we have with the GoPro as well) is we would have preferred to see a slightly more rounded shape that would more effectively cut through the wind and be less likely to cause damage in an accident. However, we recognize this is a product for training not racing, so the aero penalty is not really an issue. Operation of the Rideye is extremely straight forward. A single button on the top of the camera starts and stops recording. An indicator light on the top of the unit will show the camera’s current status. 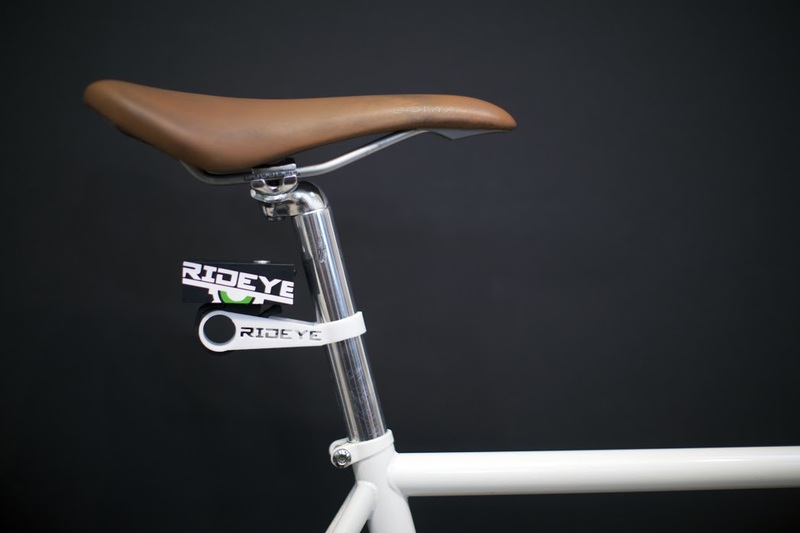 While the Rideye is designed for handlebar mounting, other mounting options such as helmet, seatpost, and GoPro mount adapter will be available in the future. 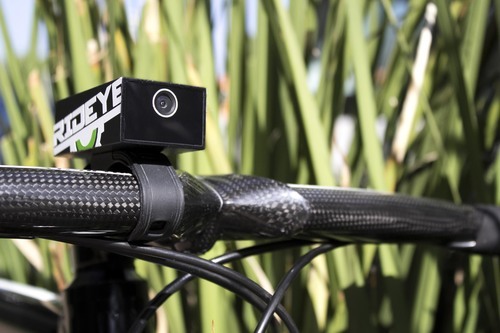 As of the posting of this article, Rideye has 7 more days to go on their kickstarter campaign – http://www.kickstarter.com/projects/rideye/rideye-the-black-box-camera-for-your-bike. They have already surpassed their original $32,000 goal but are looking to see how far the campaign can go. The bonus of the kickstarter campaign is that you can save $30 on a standard Rideye ($119 versus the standard MSRP of $149). The HC version with 32 gb of onboard storage (enough for 10 hours of footage) can be had for $169 (standard MSRP of $199). We’re big fans of the The Rideye concept. As we have stated many times, one of AG’s goals is to promote the safety and well-being of our readers. The Rideye is a product that is designed to ensure that no matter what happens on your bike, you will always know how it happened. When combined with aRoadID or IceDot Crash Sensor for immediate emergency notification, the Rideye can ensure that your loved ones will always know what happened in the event that you’re unable to share it. That kind of peace of mind is hard to put a price on, but at $119 through their quick starter campaign, Rideye has certainly made that price justifiable. Don’t waste your money on a rideye camera. It will work for a few weeks, maybe a month or two and then break down. I have gone through three of them now. It is a great idea, but it is poorly made.